One of the few features we have longed for on Chrome OS for as long as I can remember is the ability to have multiple desktops. While it may seem trivial to some, “virtual desktops” are an integral part of a lot of user’s workflow and seeing the Chromium team give them some attention is very encouraging. In late July of 2018, a bug report was created to track the development of virtual desktops but it hasn’t seen much action since that time. We learned back in November that multiple desktops were in the works and that the Chrome OS team had officially put them on the development map but no solid arrival date was set. With the addition of Linux apps and a focus on Enterprise and development, my guess is that the priority level of this feature has received a well-deserved upgrade. 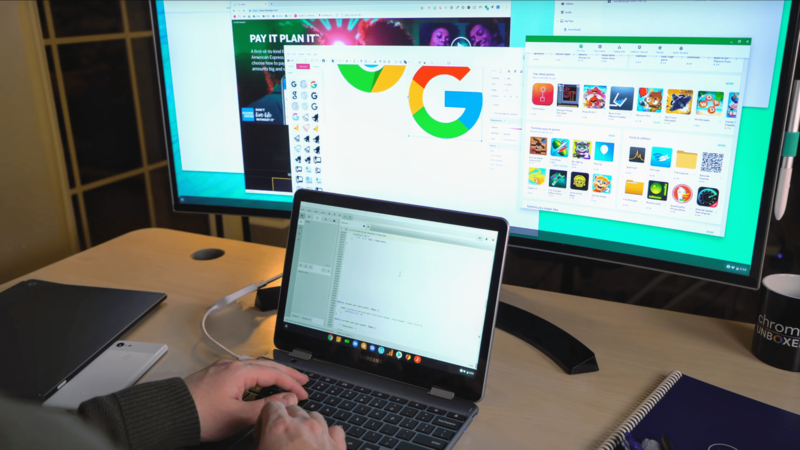 Thanks to Kyle Bradshaw’s diligence research, we now have a sneak peek of what is being called “Virtual Desks” for Chrome OS. In the aforemention bug report, an update just two days ago shares a quick video showing the UI for adding multiple desktops. As you can see, it is still very much a work in progress. It doesn’t appear that the secondary desktop is even firing but you get the general idea of how this will work. The “new desk” but, with Material Design in tow, will trigger a second and presumably subsequent desktops for users who are accustomed to this work flow from using other operating systems that have long utilized the feature. If you’d like to keep tabs on the virtual desk feature, you can star the bug report here and get updates. We will be tracking this feature and bringing you more news as it arrives.